Enter the estimated value of your home, without the dollar sign and commas. If you are not sure what your home is worth, research what homes similar to yours are selling for in your area. That should give you a fairly good estimate. Enter the current principal balance (payoff amount) of your first mortgage, without the dollar sign or commas. Optional: Enter the current principal balance (payoff amount) of a second mortgage if you have one, without the dollar sign or commas. Optional: Enter the current principal balance (payoff amount) of a third mortgage if you have one. Include any other liens you might have against your home. Leave out the dollar sign and commas. This is the total of all mortgages and liens against your home. This is the Loan-to-Value Ratio for just your first mortgage. This is the Loan-to-Value Ratio for just your second mortgage. This is the Loan-to-Value Ratio for just your third mortgage and/or other liens. Based on your entries, this is your total combined Loan-to-Value Ratio. 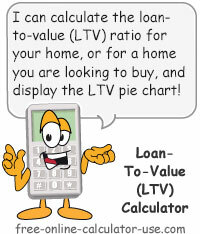 This calculator will calculate the LTV and CLTV ratios for either your present home or a home you are looking to purchase. The calculator also allows you to enter up to three mortgages taken out against a single property. Finally, the calculator will display a pie chart to give you a visual reference of the equity versus the total of outstanding liens. Enter the appraised or market value of the property. Enter the first mortgage balance. Enter the second mortgage balance, if applicable. Enter the third mortgage balance and/or any other leans, if applicable. Click the "Calculate Loan to Value" button. What LTV is and what the numbers mean. Loan-to-Value (LTV) Ratio is an assessment used by lenders to determine the risk involved with granting a mortgage to the home buyer. LTV is also used by lenders to see if they can manage to get you to borrow back the principal and down payment monies you've already paid out (line of credit or home equity loans). To calculate LTV you simply add up all mortgages and liens against the property, and then divide that result by the estimated value of the property. For example, if the total owed on the property is $120,000, and the market value of the property is $150,000, the LTV would be equal to $120,000 ÷ $150,000. This would result in an LTV of .80, or 80%. A Loan-to-value Ratio of 80% or lower is usually needed in order to secure a mortgage. LTV ratios above 80% usually require the buyer to purchase Private Mortgage Insurance (PMI) in order to be approved for a mortgage. If you have an existing home loan and you've been required to pay PMI (Private Mortgage Insurance), it might pay to keep a close watch on your LTV. Once it drops below 80% you might be able to get your lender to drop the PMI requirement. However, you may be required to pay to have an appraisal done on your home before your lender will allow you to drop the PMI. But be forewarned, paying for the appraisal does not guarantee that you'll be permitted to drop PMI.